The board also amended MBII’s Corporate Governance Guidelines to provide that director nominee are to supply a conditional letter of resignation, effective if they fail to get a majority vote and the board accepts their resignation. I hope if the board fails to accept such a resignation, that would clearly be on a temporary basis. These are small but important changes to one of my favorite companies. When I invest, I do so to make money but also to have a positive impact. MBII helps customers around the globe control pests, improve plant health, and increase crop yields while reducing the environmental pesticide load, decreasing chemical residues on food, and fighting the development of pest resistance, using less water. MBII does not make disposable junk, sugary snacks or social media that collects our personal data and sells it to the highest bidder. Instead, they are engaged in helping to create a more salubrious environment. Nothing is more important. I love the fact that both organic and conventional farmers use their products. No one wants chemical residues on the food they eat or the cannabis they consume. No one wants cancer or to develop chemical hypersensitivities. MBII makes some of the most transformative products of any company in my portfolio. Now, they are beginning to have better corporate governance. That is especially important for a micro-cap company with ambitions to grow. Good corporate governance will help them build trust among the growing number of ESG investors. Below is the shareholder proposal I filed with MBII. Resolved: Shareholders hereby request that our Board of Directors initiate the appropriate process as soon as possible to amend our Company’s policies, articles of incorporation and/or bylaws to provide that director nominees shall be elected by the affirmative vote of the majority of votes cast at an annual meeting of shareholders, with a plurality vote standard retained for contested director elections, that is, when the number of director nominees exceeds the number of board seats. This proposal includes that a director who receives less than such a majority vote be removed from the board immediately or as soon as a replacement director can be qualified on an expedited basis. If such a director has key experience, they can transition to being a consultant or a director emeritus. Supporting Statement: To provide shareholders a meaningful role in director elections, our Company’s current director election standard should be changed from a plurality vote standard to a majority vote standard where only board nominated candidates are on the ballot. This will establish a more meaningful vote standard for board nominees and could lead to improved performance. Under our Company’s current voting system, a director can be elected if all shareholders oppose the director but one shareholder votes FOR, if even by mistake. More than 89% of the companies in the S&P 500 have adopted majority voting for uncontested elections, as have 67% of the S&P 1500. During 2018, at Netflix 84.8% of shares voted FOR a similar proposal. At Marriott International 65.3% voted FOR; at Discover Financial Services 79.3% voted FOR; at The Manitowoc Company, 78.9% voted FOR; and at Costco Wholesale 86.8% voted FOR. BlackRock’s proxy voting guidelines include the following: “Majority voting standards assist in ensuring that directors who are not broadly supported by shareholders are not elected to serve as their representatives.” Among our Company’s large shareholders: BlackRock voted FOR 88.9% of shareholder proposals on this topic. SSgA Funds Management voted FOR 100% of such proposals. This proposal should also be seen in the context that shareholders have no right to act by written consent, call a special meeting or to nominate directors through proxy access provisions. Additionally, a supermajority vote is required to amend bylaws. Our Board is locked into an out-dated governance structure that reduces board accountability to shareholders. How we elect directors is just one of many needed reforms. Please vote FOR. In my transmittal I indicated, “I would be willing to withdraw my proposal if MBII required directors to resign in the event of a shareholder vote in an uncontested election in which that person does not receive a majority of the votes cast.” They took me up on the offer. I am delighted MBII elects directors by majority vote going forward. Since the change gives shareholders a stronger voice, it should make MBII slightly more attractive as an investment. 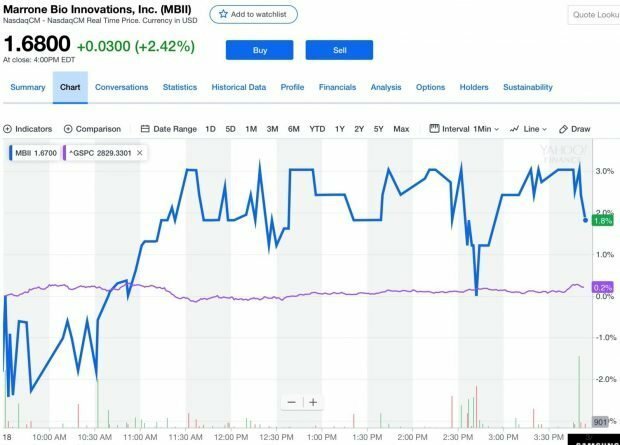 Shares were down 2% in early trading Monday March 18th but up 3% after the announcement that MBII elects directors by majority vote going forward. However, I am not looking for a short-term 5% price increase, I want MBII to gradually adopt best practices in corporate governance so it can be a better company. I look forward to working with them on declassifying the board, eliminating supermajority voting standards, and allowing shareholders to call special meetings.